Honeymoon is your second novel, tell us about Honeymoon. It’s a love story but it’s not a romance. A complicated, inconvenient past unravels during Rosie and Fergal Pierce’s short honeymoon on the West Coast of Ireland with revelations of death, betrayal and deceit that would seem to implicate Fergal. The truth is hard to find and threatens to wreck not only the honeymoon but lives of others too. Rosie faces hard decisions and decides to trust her own judgement and find her own way to help Fergal reclaim his past. During a trip to research my family tree to County Clare I spent some time in a churchyard that overlooked the wild Atlantic Ocean. It was such a desolate and haunting place, a good place to lie for eternity and a good place to start a story. What inspires you to write? Have you always been a writer? I came late to writing, after I’d had a family, after I’d had a ‘proper’ job but the compulsion write was always there. Or, to be more exact, the compulsion to make up stories and what ifs and other endings to films. A story is rather like gossip. You want it to pass from mouth to mouth like wildfire, be embellished in the telling and the retelling. Writing it down it is a much slower process – never mind turning it into a book – but the wish for it to spread, hand to hand, by word of mouth is similar. Life is short! My first book, Murielle’s Angel, was traditionally published and it’s a long, slow process even after you have a publisher. Are you available to speak to local book groups? Certainly. I would be delighted to discuss the book with reading groups. Authors need readers. All the characters a writer dreams up need readers to breath life into them. What is the most valuable help readers give authors? Apart from reading the book and talking about it and passing it on, one of the best ways is to write reviews on Amazon or Goodreads. Where is the new book available? Do you have plans to write more? Stories come from everywhere and nowhere. I’m always dreaming of something, and I certainly hope to. Your first book is set in Spain, Honeymoon is set in Ireland would you say setting is important in your books? Setting is important for me, personally, so I would think yes, very important. I am currently working on a story set in Dyffryn. I’m not sure where it will lead yet. I’ll have to wait and see. The film of the play is set on the bleak coastal hillside on the West coast of Ireland. The way of life depicted has all but disappeared, but one wonders if the sentiment remains, running through to the bone like turf down to barren rock: stark: bigoted, corrupt, inward looking, fixated on injustice, death and starvation. For the blood and bone of millions, starved and evicted, sank back into the land, or was shipped off to die far away from home. And yet the father’s grief for a son who has committed suicide, the mother’s for the son denied a christian burial by the church as cruel and unforgiving as the land, the desperate need for survival and the bitter memory of the Great Hunger and inhumane treatment by foreign landlords, is all too poignant. The American looking for his roots, unable to marry the static old world with the thrusting new, spills his blood or has it spilt for him into the earth too. My latest novel, (currently looking for a publishing home) is set on the West Coast from whence my ancestors emigrated, touches on more recent Irish history. It fails to capture the gut wrench emotion of The Field but does encapsulate the need for change, forgiveness and the all too English incomprehension of a people whom for hundreds of years they have tried and failed to subjugate. I had begun to suspect the romance of Ireland to be more imagined than actual, in the way people have created the East as a concept. We had only visited once before, sailing along the south coast as far as Baltimore when more hours were spent at sea than on shore. Possible to detect a disenchantment with sailing here, but I suppose, calling in at small fishing harbours or marinas and eating on board gives a limited view. We did, now I come to think, encounter some characters and stay a while at an excellent bluegrass festival near Cork. So it was a delight this last visit, flight to Shannon and hire car, to find what I had imagined was real. And to look for the home that had belonged to my grandfather’s family, see the place whence his name, the last of a long list of children on a census circa 1870, came . There were plenty of old homes, but none we could be sure of. 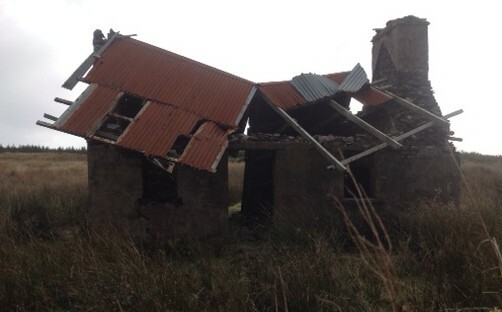 Ruins are a fairly common sight in County Clare, so too regeneration. The contrast of the two cottages photographed give pause for thought. All life is here if you look. Both tell a tale and prompt questions, especially the abandoned house with the tin roof staved in. Did the occupants die? All the sons gone abroad to seek their fortune and send money home, never to return, leaving the old farmstead to its own devices. Or simply move down the lane and build themselves something bigger, something grander? The ruin is what I expected an archetypal abandoned home testament to the sadness of all that has gone before, but I think I am in danger of falling into the construct of Ireland. 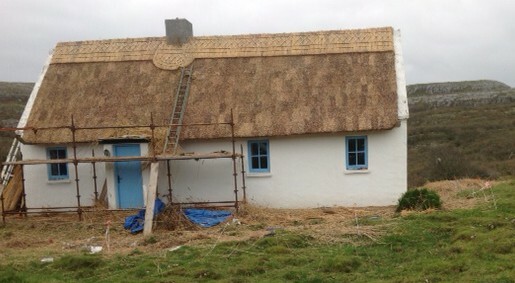 Isn’t the re-roofed house also typical and testament to regeneration and the flourishing of old skills. I have been reading Anne Enright’s The Gathering, winner of the Man Booker Prize 2007. Bit late, you might think and I would agree. Impossible now to plug the gaping holes in my reading but like the little Dutch boy attempting to prevent disaster, I keep trying. Enright examines memory almost as a good Catholic examines conscience, at times with gleeful detachment, at others with ensuing guilt, with the innocence of an eight year old and with the grief of a grown woman reassessing her life after the suicide of her brother as the family gather for the wake. The book is tender and subtle, as Colm Toibin says, but I am no judge if Enright’s vision of Ireland is ‘brave and original.’ It is an Ireland of thirty years ago, of seventy and of now, of her dreams, of her making and of her ancestry. The book is about love and disappointment and is beautiful and quite brilliant, as Joseph O’ Connor says.